Luna caught her first water-type! Like most origin stories, Sailor Moon is really a pair of tales: one is about the junior high student Tsukino Usagi, and the other is about the hero-in-training, Sailor Moon. Usagi hangs with her friends, struggles with her grades, and argues with her mom. Sailor Moon hangs with her magic cat, investigates mysteries, and works to resolve conflicts. Both make a lot of mistakes, to be sure, but one is portrayed in a much more positive light than the other, and it’s no surprise that the Sailor Moon stories interest me more than the Usagi ones. So watching her spend an episode getting mad at her friends and Luna for not helping her become a STAR! is much less interesting than watching her help a jazz musician defeat a bat-lady. Fortunately, the creators must have sensed that the Usagi Show was flagging and picked this exact moment to bring in a new character. Episode 7 – Both of you, dance like you want to win! Everyone in Usagi’s class is all a-flutter about Mikan Shiratori, a girl who went to their school and is now a fabulous celebrity. The class decides they want to become fabulous celebrities too, so Usagi and Naru start a pop band. This begins with a classic “anime characters sing their own theme song” sequence and ends with an equally classic “you stepped on my foot one times too many so now we’re RIVALS!” scene. Naru uses some frankly nasty lies (“Usagi said you’d be more attractive if you knew a little more about socializing”) to trick the oh-so-awkward Umino into becoming her new duet partner, thus triggering the standard “put dat boy in a dress!” sequence of scenes. As for Usagi, she decides to make Luna do all the work for her. Luna calls this a Tuesday. Everyone who goes to tryouts gets in. It’s basically like Little League. I assume they all got plastic trophies of faceless humans in action poses, too. Usagi wants to enter as well, but Luna finally puts her adorable paw down and tells her there are more important things going on, and no matter how many sad teenage whimpers Usagi uses (and she uses ALL OF THEM), Luna won’t budge on this. For some reason this totally normal occurrence triggers alarm bells for Usagi, so she and Luna go to investigate the eeeevil talent show, where everything’s made up and the points don’t matter. It is still slightly more organized than a regular talent show. It’s also run by a monster (so, again, a regular talent show). 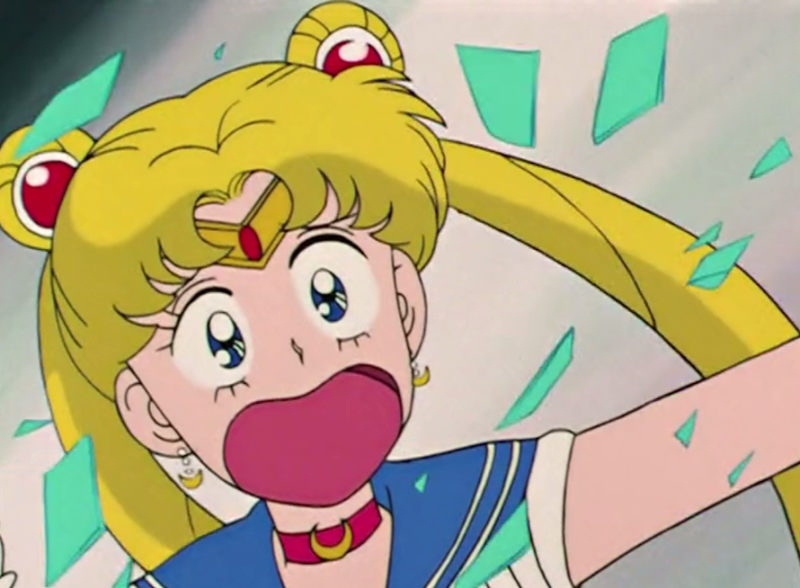 Sailor Moon sees through the Mikanganger’s disguise… and reacts EXACTLY THE WAY YOU SHOULD to that terrifying neck-twist. I mean seriously, that is some scary stuff for a 14-year-old. Thank you for being human, Sailor Moon. After some bathroom tears, Usagi bucks up when she remembers there are people in danger, and dashes back in to save the day. This monster is a level up from the previous ones, and actually manages to encase our hero in glass. Thankfully Tuxedo Mask shows up to actually do something this time, shattering the glass with a well-thrown rose. And yes. That IS how roses work. I don’t care WHAT your horticulturist friend tells you. Then he gives us some trademark dorky encouragement (“You’re the star of this show now, Sailor Moon!”) and dashes off again. 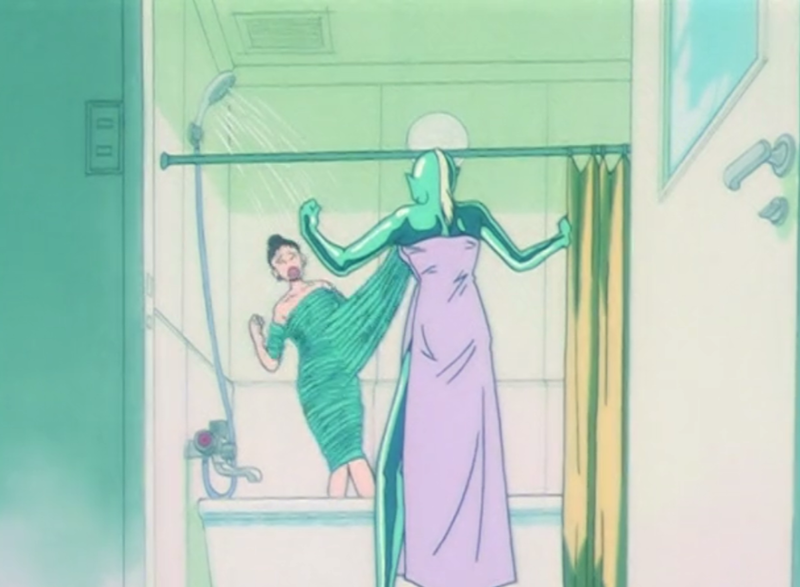 Sailor Moon makes short work of the monster, and everything is back to normal. So not a total waste, I figure. Episode 8 – The Brainwashing Cram School of HORROR! Beryl: So what do they do after they leave a first-rate university? This whole scene is particularly true of the pressure put on students in Japan, where entrance exams and cram schools take up so much time and energy, but I think it translates pretty effectively for western audiences as well. 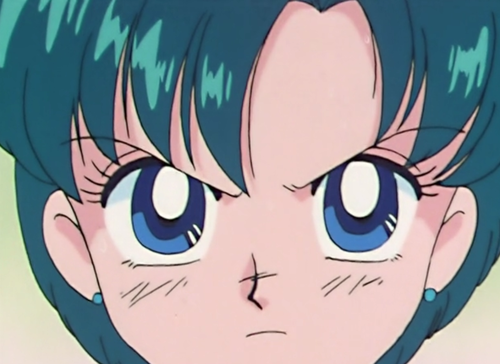 …Aaaand cut to Usagi, basically the antithesis of the “study till your brain breaks” student. She’s reading comics and throwing a hissy fit because her mom’s request that she “try not to fail” is SO UNREASONABLE that she flees in tears. Usa, seriously. Your mom is the most lenient woman on the planet. I have zero sympathy for you. Upstairs, Usagi complains to Luna that she wants to be a cat (doesn’t everybody? 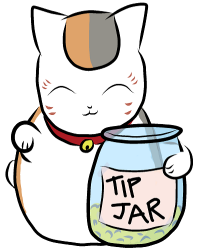 ), but Luna quickly reminds her that this swingin’ cat does a whole lot more than her owner, thank you very much. 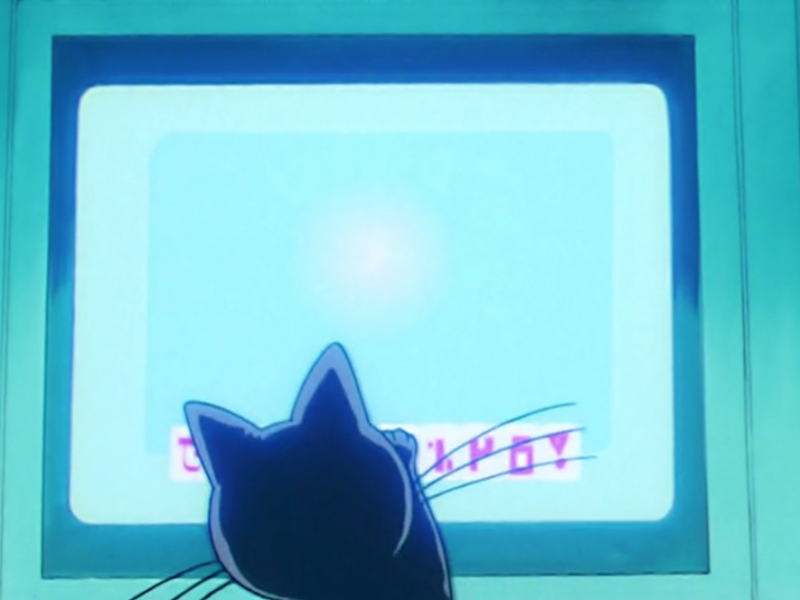 Then, to prove this point, we cut to Luna sneaking into the arcade, unlocking the Sailor Venus game, then talking and pawing at the glowing screen. Besides–look! A new character! Everyone at school is abuzz over Mizuno Ami, top of ALL the classes and with a rumored IQ of 300. 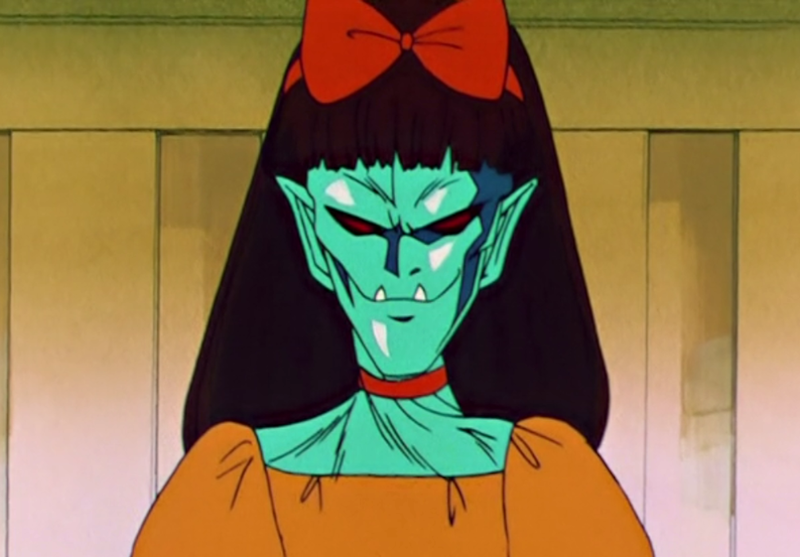 She also has a weird energy about her, which Luna thinks makes her a bad guy. Luna uses POUNCE but it’s not very effective, and then Ami counters with CHIN SCRATCH, and it’s pretty much all downhill from there. Usagi decides to be Ami’s friend, if by “friend” you mean “someone I can use for my own ends.” Usa’s not the best role model this week, but dammit if her facial expressions aren’t glorious. 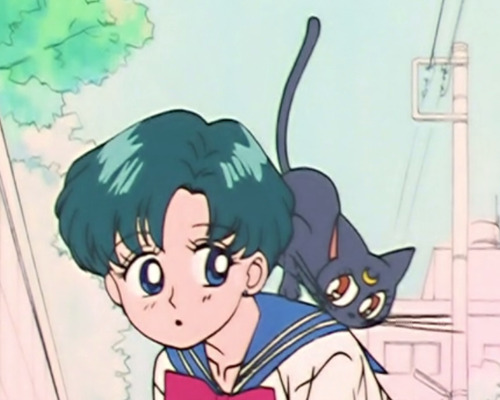 Usagi ends up with Ami’s disc and Luna wants to check it out to see if Ami really is a baddie. Luna, the Original Keyboard Cat, discovers that running the disc gives the computer a Blue Screen of Death. The HORROR! This is certain to sap the life out of anyone who sees it. Our dynamic duo sneak into the cram school only to find that all of the students have turned into zombies, and not just because they’re out of coffee. No, it’s because the lady running the cram school is a Quiz Monster (the HORROR!). She distracts Sailor Moon with academics (the HORROR! ), but when the monster grabs Ami and tries to sap her energy, it activates a glowing symbol on Ami’s forehead. And Luna realizes she’s not a villain at all! She’s on their team! 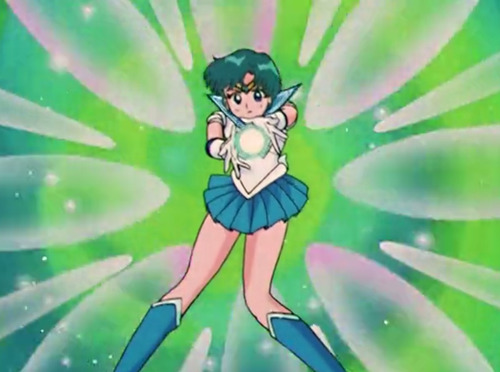 Luna tosses Ami her own Lovely Item and helps her transform into Sailor Mercury, with the power of BUBBLES! Sailor Mercury tricks the monster into destroying the energy-sucking computer, then steps back like a good sidekick and lets Sailor Moon finish her off. I hope this system is set up to evenly divvy up EXP, because if not, Mercury just got screwed. Flash forward to the school rooftop, where all Proper Anime Conversations are held. Ami is super on board with this whole crime-fighting thing. 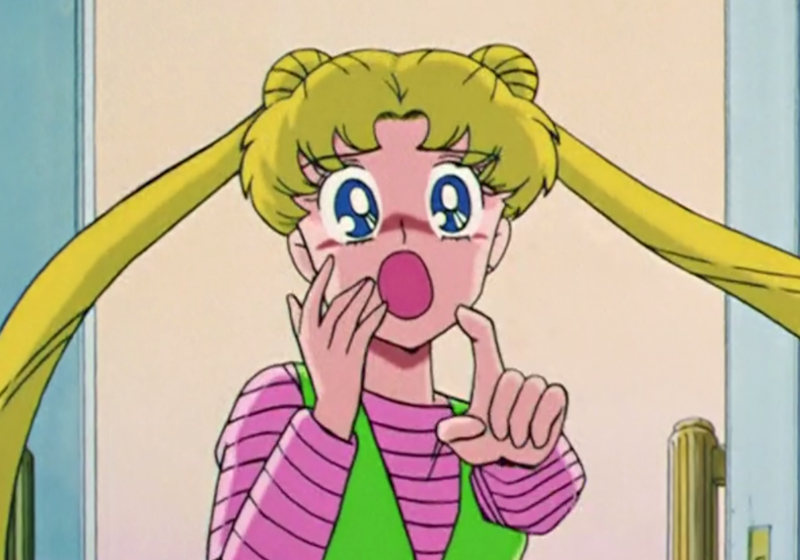 Usagi is pretty sure Ami is going to be a better Sailor Scout than she is. I kind of think so, too. Welcome to the Moonies, Sailor Mercury! I feel so bad for that police officer. The ONE adult in town actually trying to do his job, and he gets hypnotized by an evil celebrity for his troubles. I’m usually really into smart gals, so I wanted to just adore Ami, but I don’t really have an opinion yet. She seems nice enough, and I like that she’s level-headed and clever, but her character struck me as a little bland overall. Hopefully the next few episodes will take some time to flesh her out more. Usagi runs into the dark-haired d-bag in both episodes this week. He’s nicer now, but also a bit of a creeper. (“I’d hardly call it creeping,” he says while he waggles his hand in his pants pocket all creeper-like.) We still don’t know his name. I’m going to call him Stalker McGee. Floppy discs! 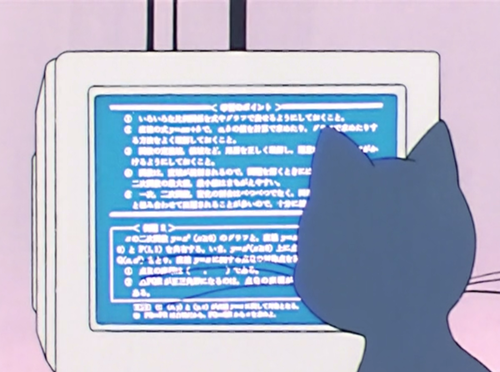 And Usagi doesn’t know how to computer! I love it when Sailor Moon dates itself. Hark! A Plot Point! 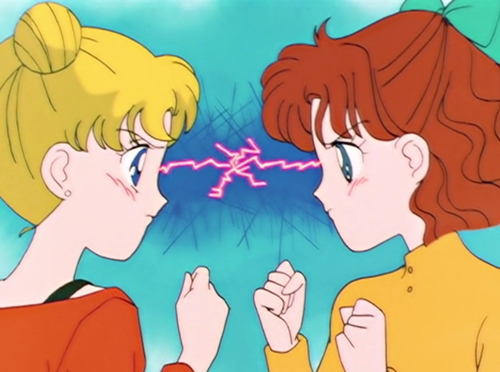 Usagi and Luna discuss the Sailor’s mission–“to find the princess and battle your foes”–but Luna claims she doesn’t know who these “foes” really are. I might have been willing to believe her if this scene wasn’t immediately followed by that status report at the arcade. Whatever Luna does or doesn’t know, she’s playing her cards close to her furry chest. 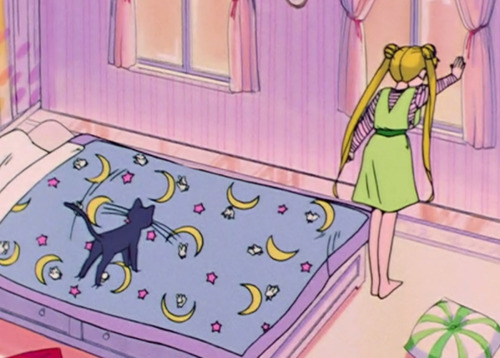 Never let it be said that Usagi doesn’t have her priorities in order. When everyone wakes up after the talent show, one of Usa’s classmates asks her friend “When did you start speaking with that accent?” This doesn’t really make sense (especially since Viz didn’t bother to actually give her an accent in the subtitles), so allow me to explain. Usa’s two classmates enter the talent show as a “manzai (漫才)” comedy duo, an Abbot-and-Costello-style stand-up act where one person pays the straight man (tsukkomi) and the other plays the clown (boke). Manzai has been around in some form since the Heian period (795-1185 A.D.), but “modern manzai” was really made popular in the 1930s in the Osaka region. The primary dialect of Osaka is the kansai dialect, so it’s not uncommon to have manzai performers speak in this accent–and this is the accent that one of the two girls adopted during their act! Manzai acts are so full of puns they don’t always translate well, but Tutorial’s Bike Bell is pretty solid. You can also search “manzai subtitles” on YouTube and go adventuring. Have fun!